Pink Primary Pupils - Pink Shirt Day in Tamaki Primary! Today is Pink Shirt Day for 2015. All around New Zealand, people from all corners, such as schools, workplaces, and other places, celebrated this day. Tamaki Primary was one of the schools celebrating and participating in this day against bullying. Participating in a sea of pink shirts and pink items and accessories, Tamaki Primary, and with the help of their Student Councillors, organized an assembly dedicated to the day. The assembly included a performance from the school band (with songs related to self-power, confidence, hope) , a skit performed from the Student Council, a short video made by the Student Council, and tonnes of fun all throughout. Throughout the day, in Morning Tea and Lunchtime, everyone was surprisingly being aware of bullying when they saw it, and was being friendly in the courts, playground, and on the field! In total, we all raised - a little over one-hundred dollars! All the money raised will be donated to the Mental Health Foundation New Zealand. Whoa. With scattered showers and high chances of rain for today, this might be a day where you need to be close to a jumper nearby. A high should probably be 24 degrees celsius, whereas a low should probably be 18 degrees celsius. The chances of rain ease down to under 20 percent, while the winds ease down to under 20 throughout the day and evening. High temperature probably 24, and low should probably be 18 once again. Nearing the end of February, we can see chances of precipitation drop between 15% and 0%. Winds are at an average 18 kilometres per hour, increasing a bit and decreasing a bit by the hour. High temperature 24 degrees , again, but the low temperature could be 17 degrees. Easy day, Wednesday. With a high of 24 degrees once again, and a low of 16 degrees, we can see this day will be increasing the hotness by the hour. Winds can be expected to die down for while in the morning then to increase a few kilometres during the day. Low chances of rain. Sunny, partly cloudy, both for Thursday. Precipitation rises just a bit for Friday, with winds increasing to 16 km/h through the day and into the evening. High temperature 24 degrees, while low 17 degrees. In shortness, a fine sunny day with a few clouds. We advise you to wear your sun hats while outside as sun protection is needed to get through the day. We apologize in advance if results of the weather through the week changes. Today for Monday, it was a cloudy yet sunny day for the school. No possible rain disturbed today, although sun protection wasn't ignored. Low chances of rain, mostly sunny day with a few clouds, but sun protection still out. Extremely low chances of rain for us, but partly cloudy throughout most of the day. Wind speeds still a bit over 20 kilometres per hour but also, slower than Tuesday's. Again, really low chances of rain for us on Thursday. Partly cloudy, but sunny as well. Winds decrease into the night, leaving a possible slight breeze for Friday. For this superstitious day, we can expect, again, low chances of rain, with clouds appearing to block the sun, but never fear, it's also sunny for other parts in the day. As said, the winds ease down below 20 kilometres per hour. Sun protection advised and encouraged. Onto the second week of Term One, and for this week we may see some chances of rain rise up and ease down to a fair chance of a rainy or sunny day. For Monday we start off with a high chance of showers, which then decrease onto an easy 24%. Luckily, for parts of the day, you can expect a cloudy but a little sunny for the day. A north westerly breeze comes in, going up to just 23 kilometres per hour. Highest temperature probably about 28 degrees celsius, while a low might be just 21. Another day with chances of showers that will decrease throughout the day, highest being 48%. Winds suddenly turn from northwesterlies to southwesterlies, reaching up to 30 or under kilometres per hour. Highest temperature could be 26 degrees and lowest could be 21, again. Amazingly enough, Wednesday could be the less-rainiest day so far! With chances of rain less than 10%, expect for a cloudy but sunny day, with western winds at a "breezy" speed, clocking between 20 and 30 kilometres per hour. Highest temperature could be a 26, while a low could be a 19. Last day for the week (since Friday is Waitangi Day), and we end the week off with...possible rain, with chances suddenly soaring through the 10%, and reaching into the 70s. Westerly winds go up to about 20 kilometres or faster, depending on what happens. Bring a raincoat, just in case this actually comes true. Highest temperature might be 22 degrees, while lowest might be 19. With Waitangi Day, it's better than Wednesday, with chances of rain dropping below Wednesday's chances. We can hope for the chances of rain, or rain in particular, to back off for the day, leaving us with a warm and mostly sunny day, temperatures going from a high 23, to a low 18. Although we have sunny parts in our day, stay aware about the southwesterly winds, possibly reaching up to 30 kilometres or higher. That's the weather for this week. Enjoy. Weather data provided by 3, or possibly more, websites. Weather may be different than what is read in this so please, stay safe and aware in the outdoors. In case of a situation where the Weather Report is technically right for a week, be glad to have the Weather Report on the Tamaki Primary School News website. Weather for Term One, Week One! To start off the term, with a high of 27 degrees celsius (low 19, possibly), we should expect to see hardly any rain with precipitation chances being below 40%. Meaning, more than 60% of a sunny day. That's great! South easterly winds will get up to about 16 km/h. Other than that, a great start to the term and school year. Onto the second day of term one now, and the winds might start to ease up a bit, going over 20 kilometres per hour, and maybe a chance of rain. Although, there is a bigger chance of not having rain, so never fear. We could possibly have a high of 29 degrees celsius, and a possible low of 19 degrees celsius. Third's the word for Thursday! With a high of a possible 28 degrees (low maybe 20 degrees), you can hope for no rain with a high chance of over 30% of rain to drizzle our day. But again, it's almost sunny. With a top wind speed going up to possibly 29 degrees, we may face some winds over 20 kilometres per hour. A low of 21 degrees, with a high of 27, to end the school week, we have a chances of rain ready to come out on the weekend, but hopefully it doesn't spoil our last day of the school week, with small winds rising up to about 21 kilometres per hour. That is your weather for this week. May not go as well but these are predictions. Back in 2014, Tamaki Primary was in the newspaper. There were numerous times we were noticed on the media, and this is the latest headline. 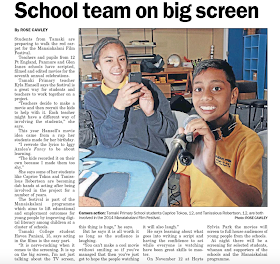 Written by Rose Cawley talks about our school and the annual Manaiakalani Movie Festival. To read this article for yourself, click this link! School is back! The start of Term One, 2015, will begin on JANUARY THE 27TH. Please do not attempt to "accidentally" miss the first day of school! Be prepared for another year of amazing learning! Welcome everyone! This blog is about Tamaki Primary School. The Media team work hard each week to produce exciting and important news about our school. Please leave a comment and give us feedback about our school or about our fantastic media team.